During the late evening of Thursday December 28th, 2017, the Prince George RCMP responded to a report of a Home Invasion style robbery at a residence on Redwood Street in Prince George. Multiple suspects forced their way into the residence with weapons and stole several items. Three persons in the residence received non-life threatening injuries. Ivan Christopher SKIN should be considered VIOLENT and should not be approached. If located, immediately call 9-1-1. 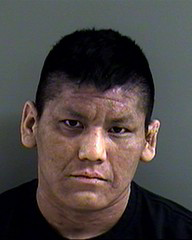 If you have any information about Ivan Christopher SKIN or where he might be, please contact the Prince George RCMP at (250)561-3300 or anonymously contact Crime Stoppers at 1(800)222-8477 or online at http://www.pgcrimestoppers.bc.ca (English only). You do not have to reveal your identity to Crime Stoppers. If you provide information that leads to an arrest, you could be eligible for a cash reward.